Use these baseboard registers when taller wall base is installed. These white diffusers are made from stamped steel and are 5.5" tall. You can install these baseboard registers in both commercial and residential locations. Shoemaker's white diffusers are finished with a durable powder coat to protect the steel. Installation of baseboard registers has never been easier due to the removable faceplate. Being able to remove the white diffuser's faceplate also makes cleaning them a breeze. Moreover, there is a functional damper attached to the white diffusers which will allow for the amount of air flow to be regulated. The sunburst design on the front of the white diffusers will create 3-way air deflection. 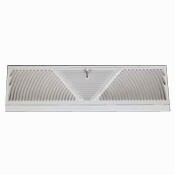 Find shorter baseboard registers in a variety of designs and finishes. Easily match the height of taller baseboards with Shoemaker's baseboard diffusers.